Egyptian authorities have arrested doctors, nurses and professors suspected of being involved in an international organ trafficking ring. The arrests of at least 25 people on Tuesday also included organ buyers and middlemen, the country's Administrative Control Authority said. Authorities also found "millions of dollars and gold bullion". It is illegal to purchase organs in Egypt, but poverty drives some to sell their body parts. The Administrative Control Authority, a powerful anti-corruption body, claimed the network targeted on Tuesday was "made up of Egyptians and Arabs taking advantage of some of the citizens' difficult economic conditions so that they buy their human organs and sell [them] for large sums of money". The statement on the government website added that the group was "the largest international network for trading human organs". It is said the investigation, which also involved the health ministry, focused on a group of private hospitals and health centres, both licensed and unlicensed, where transplants and organ-harvesting took place, according to the Reuters news agency. Authorities have also seized computers and documents from the 10 centres. 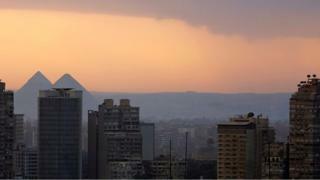 The arrests follow years of concern over the illegal organ trade in Egypt. In 2010, it was named as one of the top five countries for illegal organ trade by the World Health Organization's co-ordinator at the time, Luc Noel. Egypt passed laws to try to curb the trade, but according to the United Nations, hundreds of poor Egyptians still sell kidneys and livers each year to be able to buy food or pay off debts. There have also been concerns over the fate of migrants who come into contact with the traffickers. In 2012, then UN refugee agency chief, Antonio Guterres, said some migrants in Egypt's Sinai peninsula were being "killed for the traffic of organs", while earlier this year a people smuggler told Italian prosecutors that those who could not pay their debt were sold to the organ traffickers. The allegations have not been proven, however.